Every two years, the international scientific community gets together to exchange the newest developments in severe storm research. These conferences are organized by ESSL and a local partner at varying locations across Europe and the Mediterranean. They are supported by the European Meteorological Society. 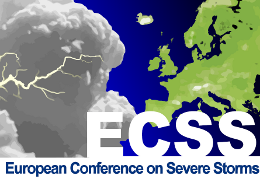 The ECSS conferences, supported by the European Meteorological Society, cover all aspects of severe convective weather. The conference topics range from storm dynamics, microphysics and electrification to forecasting, nowcasting and the detection of storms by radar and satellite. The main subjects also include the climatology of severe weather, societal impacts as well as assessment and mitigation of risks. The Conferences take place at two-yearly intervals and are organized by the European Severe Storms Laboratory (ESSL) at varying locations across Europe, often in cooperation with a local organizer. Past conferences were held in Toulouse, Prague, León, Trieste, Landshut, Palma de Mallorca, Helsinki, Wiener Neustadt and Pula. The 10th ECSS will take place from 4 to 8 November 2019 in Kraków, Poland. De facto, the ECSS conferences are the European counterpart of the American Meteorological Society’s series of conferences on Severe Local Storms, being organized in alternating years. The last ECSS conferences have seen their participation increase to slightly over 200 participants. The majority of these participants are researchers from Europe, the United States, and other countries, including many lead scientists in the field. Additionally, representatives from weather services, the reinsurance sector, manufacturers of meteorological measurement equipment and software as well as the media have taken part in the conferences.